The West has long defined the pursuit of happiness in economic terms but now, in the wake of the 2007-8 financial crisis, it is time to think again about what constitutes our happiness. In this wide-ranging new book, the leading economist Daniel Cohen traces our current malaise back to the rise of homo economicus: for the last 200 years, the modern world has defined happiness in terms of material gain. Homo economicus has cast aside its rivals, homo ethicus and homo empathicus, and spread its neo-Darwinian logic far and wide. Yet, instead of bringing happiness, homo economicus traps human beings in a world devoid of any ideals. We are left feeling empty and dissatisfied. Today more and more people are beginning to recognize that competition and material gain are not the only things that matter in life. The central paradox of our era is that we look to the economy to give direction to our world at the very time when social needs are migrating toward sectors that are hard to place within the scope of market logic. Health, education, scientific research, and the world of the Internet form the heart of our post-industrial societies, but none of these belong to the traditional economic mould. While human creativity is higher than ever, homo economicus imposes himself like a sad prophet, a killjoy of the new age. 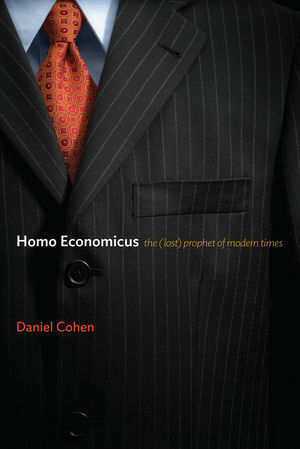 Drawing on a rich array of examples, Cohen explores the new digital and genetic revolutions and examines the limitations of homo economicus in our rapidly transforming world. As human beings have an extraordinary ability to adapt, he argues that we need to rebalance the relation between competition and cooperation in favour of the latter. This thought-provoking analysis of our contemporary predicament will be of great value to anyone interested in the relationship between what happens in our economies and our personal happiness. Daniel Cohen is a French economist and a professor at the école d'économie de Paris as well as a senior advisor to the bank Lazard. Susan Emanuel is the author of Homo Economicus: The - Lost - Prophet of Modern Times, published by Wiley. "What are we losing, as we are increasingly pressured to define the pursuit of happiness in narrowly economic terms? That is the question Daniel Cohen asks  and indeed answers  with frequently piercing new insights in this thought-provoking combination of ancient history, sociology, psychology and alternative economics." "The economy is the driving force of our world but to what end? In a fascinating book, the economist Daniel Cohen offers a long-term perspective on the relation between the search for individual happiness and the market. He shows how the market, in imposing its own model and valuing competition above everything else, has disrupted the relations between human beings. The emergence and eventual triumph of Homo Economicus has led to the collapse or stagnation of the indicators of wellbeing in the most advanced countries." "Find happiness, or try to achieve it: a topic addressed often in the past by literature or philosophy is now a topic for economics. In Homo Economicus, the economist Daniel Cohen shows how our ultra-competitive societies have disrupted social relations and undermined all the indicators of wellbeing. He starts from a sombre fact: never before has so much wealth been created, never have people had access to so many goods, and yet they are not happier  if anything they are less happy. Why?" "A highly readable, thought-provoking critique."